The current tax year, 2012/13, is an important one for tax credits claimants and their advisers. Since an emergency Budget in June 2010, the Coalition Government have made a series of announcements affecting not only the rates and thresholds, but also working hours, income rules, time limits and entitlements. New areas of complexity have entered an already complex system, with the potential to trip up claimants, advisers and HMRC officials alike, while stories in the press and media have often obfuscated rather than enlightened. HMRC’s compliance activities have stepped up a grade, and with revenues to protect and budgetary constraints to cope with, investigation teams are not always too careful about claimant rights and safeguards. Small businesses claiming working tax credit are a particular target, as are single claimants and those claiming disability and childcare elements. Against this shifting landscape, plans are going ahead to phase out tax credits over the next five years and introduce the new universal credit gradually from October 2013. 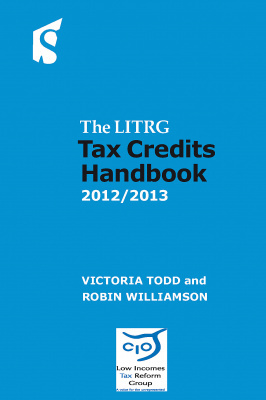 The Tax Credits Handbook 2012/13 covers the whole of this complex area in depth. Intended principally for advisers in tax and welfare rights, but also for officials, academics and the lay claimant with a wish to understand more about how tax credits work, this book provides detailed commentary and practical guidance on who can claim and how a claim should be made. It describes the award cycle from initial claim to renewal, with detailed examples on how to calculate entitlement and how to deal with changes in income and circumstances through the period of an award. All the elements of working tax credit and child tax credit are examined in depth, including childcare. The vexed question of tax credit overpayments is covered in two chapters – how they arise, how to avoid them and how to challenge them. There is also commentary on HMRC powers of investigation – examinations, enquiries and so forth – and claimants’ rights, safeguards and remedies when faced with wrong decisions, including how to conduct appeals, disputes and complaints. Throughout, the commentary is based on legal provisions and precedents but with an intensely practical slant. A chapter dedicated to how as an adviser one should deal with HMRC, based on the authors’ experience and that of the Low Incomes Tax Reform Group over the years, is included. The authors also provide an historical perspective of tax credits and the policy underpinning them. They also survey expected changes over the next few years, including a brief overview of universal credit and how it compares with tax credits. Finally, particularly for those working in welfare rights advice, there is a short section on problem areas when tax credits interact with other welfare payments. About the authors: The authors, Victoria Todd and Robin Williamson, both members of the Low Incomes Tax Reform Group, have been actively involved in the HMRC and Treasury consultations on tax credits and have frequently written, lectured and broadcast on the subject over the past decade and more.